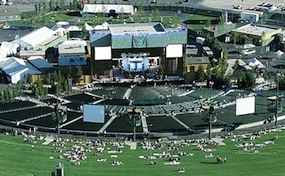 The Toyota Amphitheatre in Wheatland was formerly known as the Sleep Train Amphitheater, Sacramento Valley Amphitheatre and the AutoWest Amphitheatre. The Toyota Amphitheatre box office is located at 2677 Forty Mile Road in Wheatland, California. The maximum seating capacity is currently 18,500. Toyota Amphitheater tickets have included popular performers like Luke Bryan, Brad Paisley, Lady Antebellum, Motley Crue, Dave Matthews Band, Jason Aldean, and many more. With 10,000 plus lawn seats available there is a great chance to throw a balnket down and enjoy a great concert outside. Toyota.AmphitheatreWheatland.com is an independently owned and operated company that concentrates exclusively in the online retail of all events in the secondary resale market. We are not at this time affiliated with any team, supplier, venue, primary box office, or official website. Prices on our sites are often above face value and can change quickly with market demand. To order tickets to all Toyota Amphitheater Wheatland events please follow the steps online through the checkout or call one of our friendly operators at anytime.